I've said it before but one of the coolest parts of this job is getting to visit some unique places around this city, both new and old. With Erin and Tim's wedding, we got to do a little bit of both! Erin and I have been friends for a few years so when she called me about doing her wedding, I was a little more than excited. It quite possibly was the easiest booking we ever had, too, because she called me while I was driving to another wedding. The call only lasted about ten minutes! Erin and Tim decided they wanted to do all of the portraits before the ceremony so they could relax and enjoy the reception afterward. We met up a few days beforehand to plot out where we were going to go and what we wanted to accomplish. The 'new parts of the city' part came in the form of their wedding at the Freedoms Foundation in Valley Forge. It's a really cool campus just behind Valley Forge Park. We met up with them at the start for some getting ready pictures there before heading out for wedding portraits in Valley Forge Park. Erin and Tim had their first look at the chapel (see below!) before hopping into King Bob's 1970 Cadillac DeVille and heading out for bride and groom portraits in the park. The couple had picked out a few spots in the meetup a few days before so we were able to work fairly efficiently to get what they wanted! Winter wedding bridal portraits can be tough depending on the weather but these came out gorgeous (if you ask us ;) ). We were able to incorporate a portrait of the couple at Varnum's Quarters and a portrait at the Cabins in the Field! We even stopped for a quick picture of the bride and groom at the Arch in Valley Forge Park. Then we headed back to the Freedoms Foundation for their ceremony and reception. 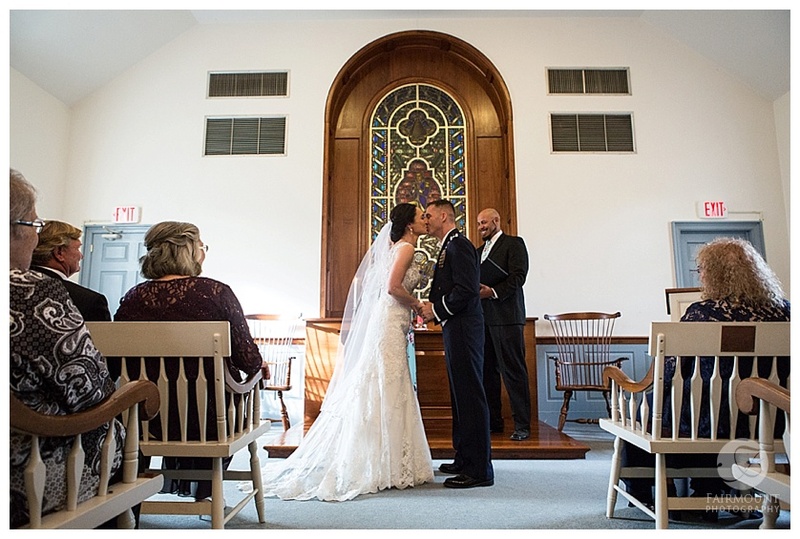 The groom is part of the Armed Forces so the location really meant something to him. The ceremony was held in a small chapel on the grounds before heading over to the main building for their reception (which included cutting the cake with a sword!). As I was walking out at the end of the night I saw this enormous American flag flapping in the wind (it wasn't earlier in the day) so I ran back and grabbed the couple to get a picture of them with it. It was the perfect ending! Aug 4, 2012 JoyAnn & Brian share the love for each other —and Philly sports! Oct 17, 2010 Look —it's a bride! Aug 30, 2010 CASTING CALL: Let's trash your dress! May 27, 2010 Dear Brides, I feel your stress! Nov 30, 2009 Welcome to our new website!